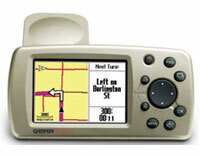 Garmin Quest 2 (010-00453-00) €0.00 including FREE DELIVERY - buy online at mysatnav.ie Ireland - FREE SHIPPING. Route avoidance - motorways, tolls etc. The easy-to-use, portable, Garmin Quest 2 is loaded with the high-end navigation features from Garmin�s most popular GPS navigators. It can be easily transferred between vehicles or slipped into your pocket for handy on-foot street-level navigation. The Garmin Quest 2 is preloaded with the latest Mapsource City Navigator NT Europe v9.0 street-level maps for Ireland, the UK and Europe. Based on Q2, 2006 Navteq map data, there is street-level detail for every town and village in Ireland and all the recent major road additions and upgrades are available including the M4 Toll Road and M1 upgrade. It features automatic routing with turn-by-turn directions and voice guidance, a rechargeable internal lithium-ion battery that provides up to 20 hours of use and a 256-color, bright, sunlight-readable display. The unit is waterproof so it is suitable for use on motorbikes and has a special optional mounting bracket. The waterproof Garmin Quest series are the only true multi-function GPS devices that can be used in a motor vehicle, on a motorcycle, in a boat or for hillwalking. The Quest 2 comes preloaded with the latest mapping for Europe, City Navigator NT v9.0, and is capable of full route planning and multi-stop journeys. The Quest 2 has been available for several years and is now approching the end of its manufacturing run. While Garmin will continue to support this product for several years, we would only recommend this GPS if you need a unit that is flexible and can be used for street navigation, marine and off-road persuits.